Bruce Banner meets his new lab staff (and has a bit of fun at their expense) before being whisked away to deal with a threat from Marvel's go-to aquatic bad guy Attuma. Bruce Banner is introduced to the Chinese equivalent of S.H.I.E.L.D. who incite a Hulkout with far less finesse than even Maria Hill. Hulk easily smashes through Attuma's forces before coming face to face with the big bad who proves to be a more formidable threat. I worry this title may be becoming a tad repetitive and predictable. I really enjoy Waid's take on Bruce Banner. It's always fun watching him needle S.H.I.E.L.D. personnel and witnessing the dark humor with which he now approaches his reputation. I especially liked the reveal of Banner's new residence and that little flourishes Waid adds to the script to make one wonder just to what degree Banner is playing everyone around him. However the issue follows roughly the same outline as the last three. Banner is doing something in his lab and then goes out to complete a S.H.I.E.L.D. mission. This wouldn't be a bad formula if the lab scenes were given more time to evolve, and if the Hulk scenes were given any sort of stakes. 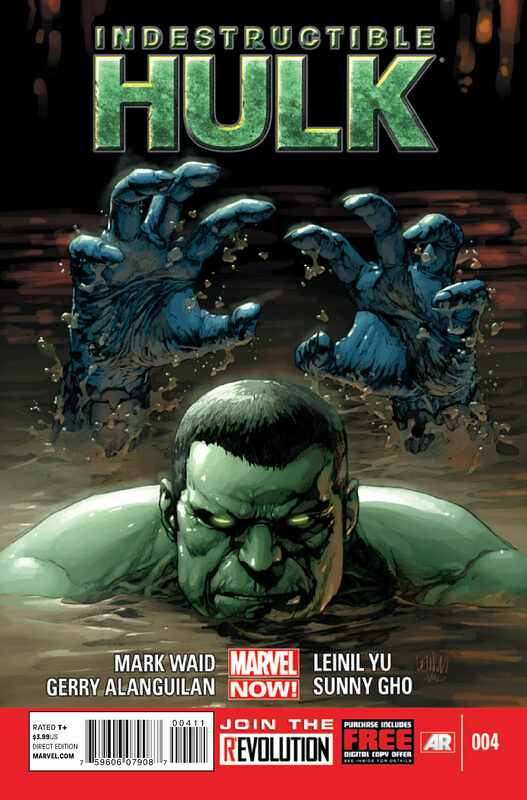 Waid has really been playing up the immense power the Hulk possesses. And while watching him tear through super villains like tissue paper was fun the first few times around, it's really starting to carve out any stakes or tension from the fight scenes. Hopefully the cliffhanger ending of this issue will lead to that problem being addressed next month. Francis Yu's art isn't always the most easy to follow, and this problem is compounded in the under water environments. I had to do several scans of the Hulk fight to really get a flow of the action. However his larger visuals are truly stunning, chief among them sea monsters attacking shipping freighters, the reveal of the Chinese version of the Hellicarrier and the wide shot of Banner's new neighborhood. One area in which Francis Yu is truly excelling is in showcasing the raw power of Hulk while still maintaining the expressive details in his face. Don't get me wrong, I'm still on board with this title. Waid has more than earned the trust from me to sit back and enjoy a slow burn. But with the new status quo firmly established I hope that we can get to the larger plan soon, as so far, with minor tweaks, any of the last four issues could have read as the first issue of this series.